I am seriously bummed that Jeremy Lin has a bad knee. 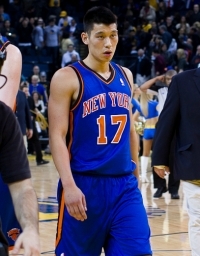 I am going through Linsanity withdrawal. Linsanity is a form of delirium that I’ll willingly practice and admit to. It is a nice counterbalance to the individualism that is marketed by the NBA. The NBA promotes its stars, and it is effective marketing. I am a fan of the Los Angeles Lakers because of Kobe Bryant. Michael Jordan is truly transcendent in how he has elevated the possibilities of how the game of basketball can be played by an individual. And get this—Michael Jordan was not the best pure athlete on his team! Scottie Pippen, his main “sidekick,” was more gifted athletically! But there was something to the way that Jordan played the game that elevated him above his peers and made him a superstar. He was truly entertaining and amazing to watch! But Michael Jordan did not begin winning his six championship titles until he involved and elevated the play of his teammates. All the commentators will state that the greatest players are the ones who elevate the play of their teammates. They inspire them with their leadership and play. They help to make their teammates transcend their own talents. That is why great players are measured by the number of championships they win—not by their individual stats. But Linsanity is a different. Lin is definitely not as athletically gifted as his teammates. It is already quite “transcendent,” statistically speaking, that he is 6’3″ (or 190 cm as the rest of the metric world would measure it) tall. He is an excellent symbol for us Asian males (as opposed to the disgraceful Willie Hung of American Idol infamy) because he went to Harvard, obtained a perfect score on his math SAT (respectful but not awe-inspiring), can dunk a basketball (something the rest of us Asian height-challenged mortals often dream of), and is playing and succeeding in the NBA (unbelievable!). Yet, if we take a closer look at this phenomenon, the true beauty of all of his accomplishment is that Linsanity is achieved with such humility and harmony. Have you noticed that during his frequent interviews, Jeremy Lin is always praising his teammates and reminding us that basketball is in the end, a team game? That is why his teammates like if not love him. My guess is that Kobe and Michael’s teammates respect, are inspired by, and perhaps fear them. But do they like them? We’ll have to ask them to know for sure. However, a recent online survey ranked Kobe Bryant as one of the least likable superstars in professional sports. He cultivates the aura of an assassin. And most assassins work alone. because it is lower than they are. Humility gives it its power. you must place yourself below them. you must learn how to follow them. wants his opponent at his best. enters the mind of his enemy. follows the will of the people. but they do it in the spirit of play. and in harmony with the Tao.